Various bio-applications of mesoporous materials (e.g., the immobilization of enzymes or the delivery of biomolecules such as siRNA) require large pores for the successful adsorption of the rather large molecules of interest and protecting the fragile cargo from external forces such as degradation. We describe the facile synthesis of functionalized mesoporous silica nanoparticles with large pores (LP-MSNs) providing high loading capacity for the immobilization of two differently-sized enzymes. The synthesis procedure yields homogeneous core–shell particles of about 100 nm in size with large mesopores (about 7 nm in diameter) and an azide-functionality inside the pores. The LP-MSNs were synthesized employing a co-condensation approach with the rather large micellar template cetyltrimethylammonium p-toluenesulfonate (CTATos). Due to the azide functionality, the LP-MSNs are suitable for bio-orthogonal click chemistry reactions within the porous network. Two different acetylene-functionalized enzymes (sp-carbonic anhydrase (CA) and sp-horseradish peroxidase (HRP)) were immobilized in the pores of the obtained LP-MSNs by a copper-catalyzed 1,3-dipolar cycloaddition reaction. The covalent attachment of the enzymes within the mesopores allowed us to investigate the catalytic performance of the enzyme–silica systems. The enzymes are stable after bioconjugation with the silica support and show high catalytic activity over several cycles for the colorimetric reaction of guaiacol (2-methoxyphenol) in case of LP-MSN–HRP and the hydrolysis of 4-nitrophenyl acetate (NPA) by LP-MSN–CA. Adding cesium (Cs) and rubidium (Rb) cations to FA0.83MA0.17Pb(I0.83Br0.17)3 hybrid lead halide perovskites results in a remarkable improvement in solar cell performance, but the origin of the enhancement has not been fully understood yet. In this work, time‐of‐flight, time‐resolved microwave conductivity, and thermally stimulated current measurements are performed to elucidate the impact of the inorganic cation additives on the trap landscape and charge transport properties within perovskite solar cells. These complementary techniques allow for the assessment of both local features within the perovskite crystals and macroscopic properties of films and full devices. 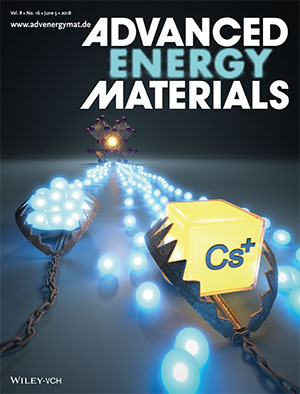 Strikingly, Cs‐incorporation is shown to reduce the trap density and charge recombination rates in the perovskite layer. This is consistent with the significant improvements in the open‐circuit voltage and fill factor of Cs‐containing devices. By comparison, Rb‐addition results in an increased charge carrier mobility, which is accompanied by a minor increase in device efficiency and reduced current–voltage hysteresis. By mixing Cs and Rb in quadruple cation (Cs‐Rb‐FA‐MA) perovskites, the advantages of both inorganic cations can be combined. This study provides valuable insights into the role of these additives in multiple‐cation perovskite solar cells, which are essential for the design of high‐performance devices. 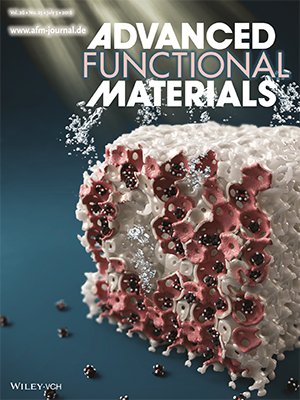 Tin oxide‐based materials attract increasing attention as anodes in lithium‐ion batteries due to their high theoretical capacity, low cost, and high abundance. Composites of such materials with a carbonaceous matrix such as graphene are particularly promising, as they can overcome the limitations of the individual materials. The fabrication of antimony‐doped tin oxide (ATO)/graphene hybrid nanocomposites is described with high reversible capacity and superior rate performance using a microwave assisted in situ synthesis in tert‐butyl alcohol. This reaction enables the growth of ultrasmall ATO nanoparticles with sizes below 3 nm on the surface of graphene, providing a composite anode material with a high electric conductivity and high structural stability. Antimony doping results in greatly increased lithium insertion rates of this conversion‐type anode and an improved cycling stability, presumably due to the increased electrical conductivity. The uniform composites feature gravimetric capacity of 1226 mAh g−1 at the charging rate 1C and still a high capacity of 577 mAh g−1 at very high charging rates of up to 60C, as compared to 93 mAh g−1 at 60C for the undoped composite synthesized in a similar way. At the same time, the antimony‐doped anodes demonstrate excellent stability with a capacity retention of 77% after 1000 cycles. Light-driven water electrolysis at a semiconductor surface is a promising way to generate hydrogen from sustainable energy sources, but its efficiency is limited by the performance of available photoabsorbers. 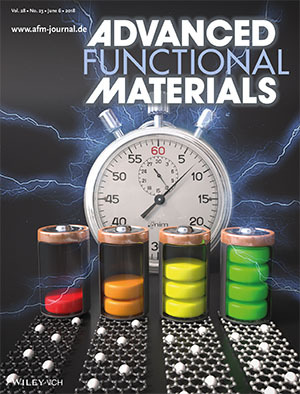 Here we report the first time investigation of covalent organic frameworks (COFs) as a new class of photoelectrodes. 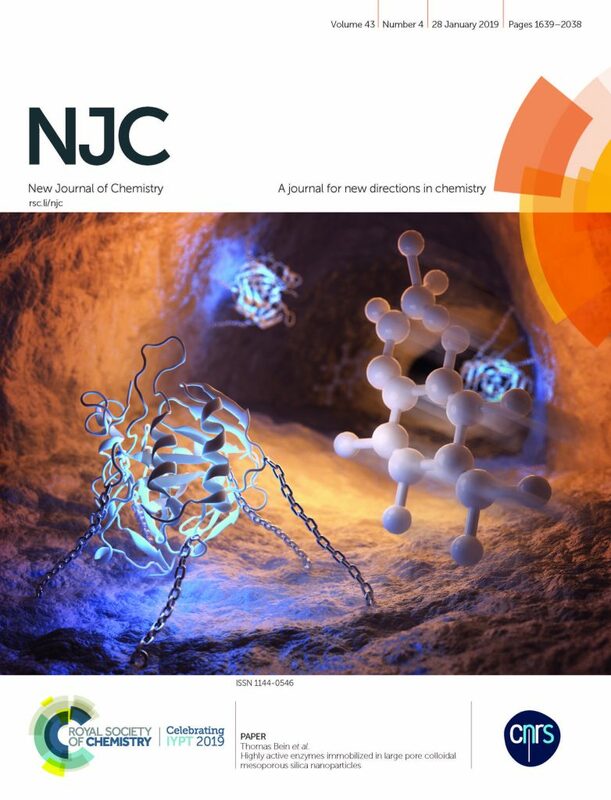 The presented 2D-COF structure is assembled from aromatic amine-functionalized tetraphenylethylene and thiophene-based dialdehyde building blocks to form conjugated polyimine sheets, which π-stack in the third dimension to create photoactive porous frameworks. Highly oriented COF films absorb light in the visible range to generate photoexcited electrons that diffuse to the surface and are transferred to the electrolyte, resulting in proton reduction and hydrogen evolution. 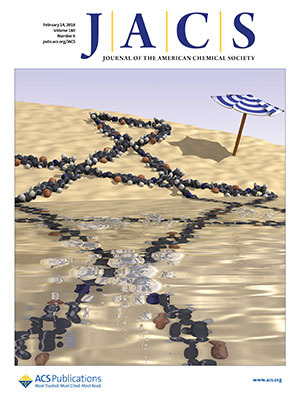 The observed photoelectrochemical activity of the 2D-COF films and their photocorrosion stability in water pave the way for a novel class of photoabsorber materials with versatile optical and electronic properties that are tunable through the selection of appropriate building blocks and their three-dimensional stacking. The n-type semiconducting spinel zinc ferrite (ZnFe2O4) is used as a photoabsorber material for light-driven water-splitting. It is prepared for the first time by atomic layer deposition. Using the resulting well-defined thin films as a model system, the performance of ZnFe2O4 in photoelectrochemical water oxidation is characterized. Compared to benchmark α-Fe2O3 (hematite) films, ZnFe2O4 thin films achieve a lower photocurrent at the reversible potential. However, the oxidation onset potential of ZnFe2O4 is 200 mV more cathodic, allowing the water-splitting reaction to proceed at a lower external bias and resulting in a maximum applied-bias power efficiency (ABPE) similar to that of Fe2O3. The kinetics of the water oxidation reaction are examined by intensity-modulated photocurrent spectroscopy. The data indicate a considerably higher charge transfer efficiency of ZnFe2O4 at potentials between 0.8 and 1.3 V versus the reversible hydrogen electrode, attributable to significantly slower surface charge recombination. Finally, nanostructured ZnFe2O4 photoanodes employing a macroporous antimony-doped tin oxide current collector reach a five times higher photocurrent than the flat films. The maximum ABPE of these host–guest photoanodes is similarly increased. Chromobodies have recently drawn great attention as bioimaging nanotools. They offer high antigen binding specificity and affinity comparable to conventional antibodies, but much smaller size and higher stability. Chromobodies can be used in live cell imaging for specific spatio-temporal visualization of cellular processes. To date, functional application of chromobodies requires lengthy genetic manipulation of the target cell. Here, we develop multifunctional large-pore mesoporous silica nanoparticles (MSNs) as nanocarriers to directly transport chromobodies into living cells for antigen-visualization in real time. The multifunctional large-pore MSNs feature high loading capacity for chromobodies, and are efficiently taken up by cells. By functionalizing the internal MSN surface with nitrilotriacetic acid-metal ion complexes, we can control the release of His6-tagged chromobodies from MSNs in acidified endosomes and observe successful chromobody-antigen binding in the cytosol. Hence, by combining the two nanotools, chromobodies and MSNs, we establish a new powerful approach for chromobody applications in living cells. Recently developed organic–inorganic hybrid perovskite solar cells combine low-cost fabrication and high power conversion efficiency. Advances in perovskite film optimization have led to an outstanding power conversion efficiency of more than 20%. Looking forward, shifting the focus toward new device architectures holds great potential to induce the next leap in device performance. Here, we demonstrate a perovskite/perovskite heterojunction solar cell. We developed a facile solution-based cation infiltration process to deposit layered perovskite (LPK) structures onto methylammonium lead iodide (MAPI) films. Grazing-incidence wide-angle X-ray scattering experiments were performed to gain insights into the crystallite orientation and the formation process of the perovskite bilayer. Our results show that the self-assembly of the LPK layer on top of an intact MAPI layer is accompanied by a reorganization of the perovskite interface. This leads to an enhancement of the open-circuit voltage and power conversion efficiency due to reduced recombination losses, as well as improved moisture stability in the resulting photovoltaic devices.